In this article I’d like to put out a few ideas that are aimed at making your practice session more fun. Beginners, intermediate and advanced players should be able to find something that they can use here, but this article is dedicated to the many adult amateur musicians out there. I’ve come to know many of these saxophone and clarinet players through e-mails and phone conversations as customers of JodyJazz mouthpieces. I have a great deal of respect for the adult player who has a serious career and a family and still finds time to practice, and play in a community band, big band, at church or the occasional gig. I’d say that the number one problem facing these players as well as all musicians is finding time to practice. So here are some ideas on how to have fun while improving your playing with that precious little practice time. You’ve worked hard all day. We want your practice time to be the best part of your day. You’re playing for fun, right? So let’s start off with a breathing routine that will relax you and get you ready for the next step. You should be in a standing position for this exercise. Take a deep, full breath, and then exhale. While exhaling, release all of the tension in your body. Take another deep breath and let your shoulders drop while you exhale. Take another breath and release the tension in your neck. With each exhalation concentrate on a part of your body and and just let go of the tension. After eight to ten nice deep breaths and full exhales you should feel ready and open for the next part of your session. Coltrones is a word that I invented after working with my students on Coltrane Ballads. Coltrones are long tones inspired by Coltrane’s sound. David Gross, a fine saxophone teacher in New York City, was the first person to turn me onto playing with recordings of John Coltrane ballads for use mainly as tone studies. I took it a step further with Coltrones. Your first long tone of the day will be modeled after Coltrane’s first long tone on Soul Eyes. (See “Soul Eyes Notes” below for information on purchasing this CD, but if you don’t own this CD any Coltrane ballad will do. Just follow the directions on how to play Coltrones.) Play the CD pausing after the fourth note of Soul Eyes, which is a D concert. Then play that note on your horn and try and get as close as you can to Coltrane’s Sound. Use one of those nice deep breaths to get the full support you’ll need to try and match his sound. Listen again to the fourth note of the CD, then pause it and try and match it. Think about what you have to change about your breath support, your embouchure and your oral cavity to more closely match Coltrane’s sound. Experiment. Most of my students don’t play strong enough at first. Don’t be afraid to play slightly louder than you think you should, to match the bigness of the tone. After trying to match the fourth note many times you can move on to the second long note of Soul Eyes which is a B concert. After your work with Coltrones you might as well try and play some of Soul Eyes with Trane. I recommend using the transcription only as a guide. Use your ear to tell you exactly what Coltrane is doing as far as articulation, attack, vibrato and every other nuance. Don’t worry about becoming a Coltrane clone unless you plan on doing this type of work only with Trane’s music. You should also do Hawktones, Webtones, Birdtones, etc. We’re just trying to expand your tonal palette so that ultimately your sound comes through and you have the ability to shade it in any way that you want to. * Soul Eyes Transcription <http://www.jodyjazz.com/SoulEyesAlto.pdf> for Alto Sax (Eb instrum.) as an Adobe Acrobat <http://www.adobe.com/products/acrobat/readstep.html> doc. Soul Eyes was recorded April 11, 1962 and was originally released on the album titled “Coltrane” on Impulse. It’s still available on that album and also on several compilations. In an interesting side note, Coltrane once said in reference to this recording and it’s more calm nature as compared to My Favorite Things and some of the things that he’d been doing, “I did a foolish thing, I got dissatisfied with my mouthpiece and I had some work done on this thing, and instead of making it better, it ruined it. It really discouraged me a little bit, because there were certain aspects of playing – that certain fast thing that I was reaching for – that I couldn’t get because I had damaged this thing…” I just thought that it’s interesting to know that the great master, John Coltrane, went through the same mouthpiece problems that so many of us have dealt with. Once you’ve got the transcription of Soul Eyes under your belt, a nice way to have some fun with it would be to play it with the Jamey Abersold playalong CD, Ballads, Vol. 32. One of the great things about being an adult amateur with a serious day job is that you probably have some disposable income that you can spend on your hobby. I say go ahead and spend it; have fun and buy what you want. You deserve it. For this part of your workout I’m recommending that you buy a Personal Keyboard such as a Casio, Yamaha or Radio Shack keyboard. One of my students recently bought one of these from Radio Shack on sale for under $200 and it sounds fantastic. It has 100 different grooves and all kinds of sounds plus a fingered chord function which comes in very handy. Here’s my suggestion on how to use the keyboard. Pick a rhythm such as swing, funk, disco or whatever, then select a tempo, push start and the rhythm begins. With the fingered chord function selected, hit the lowest note on the keyboard. Now you should have a whole band laying down a groove for you. This is your key for the week. It’s likely that the lowest note is a C concert so you’ll be in the key D major if you play a B flat instrument and you’ll be be in A major if you play an E flat instrument. Every day for a week, or longer if you feel that you need it, you can jam in this key to all kind of different grooves and tempos. Have fun improvising while you master this key. This is my book recommendation for this article. “Sax/Flute Lessons With The Greats” by Bruce Mishkit, published by CPP Media Group and Manhattan Music Publications. I think this is one of the best Book/CD combos out there, since you actually get a lesson with Paquito D’Rivera, Dave Liebman, Lenny Pickett, Joe Lovano, Ernie Watts and Hubert Laws. Each teacher gives the lesson that they would give when someone comes to them for the first time. 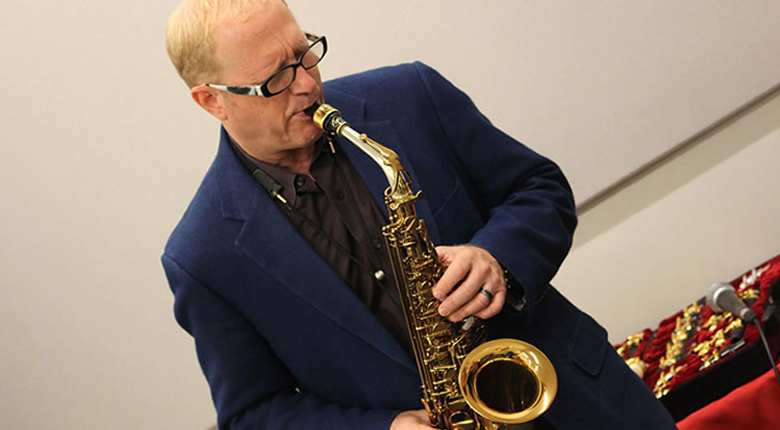 Since I had studied with Dave Liebman I was able to tell that his lesson consisted of the same things that he gave me in the first couple of lessons. So just for that it’s more than worth the price. Ernie Watts gives some great patterns to practice, it’s very inspiring to hear Ernie play these patterns so beautifully and flawlessly. Joe Lovano gives some great, practical ideas about improvisation. Each teacher actually talks to you as if you were there taking a lesson. Lenny Pickett gives some good advice on Altissimo notes and has a very interesting Etude with fingerings included. There is only one flute lesson and I don’t recommend buying the book just for that, but for sax players this book can’t be beat. I would say that this book would be best utilized by intermediate to advanced players but could be an inspiration to beginners as well. So there you have a few ideas to liven up the practice routine.